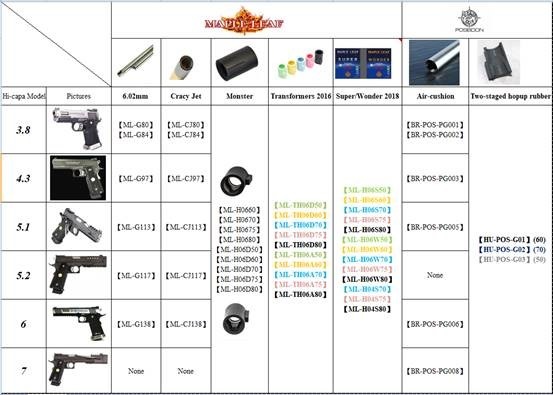 We continue to discuss on Hi-capa series and suitable escalation kits, mainly for its trajectory. WE has built a well platform and successfully deterred potential entrants with the help of invisible allies from upgrade kits manufacturers. We will introduce them at the end of this article. WE lowers players’ threshold of becoming an amateur Airsofter by proliferation in gun manufacturing to earn cost advantage, and leaves the upgrading task to peripheral workshops, collaboration has been formed under tacit agreement for years. What a great paradigm of industry! A fancy little gun more than competition purpose, these two baby Hi-capa own every delicate details in term of exterior decoration. WE Hi-capa Force meant to show lavish style in appearance. The hollow and waved engraving on slide, light-weight trigger, outer barrel and magwell all looks like steel but actually not. Cute enough to be a pocket collection. 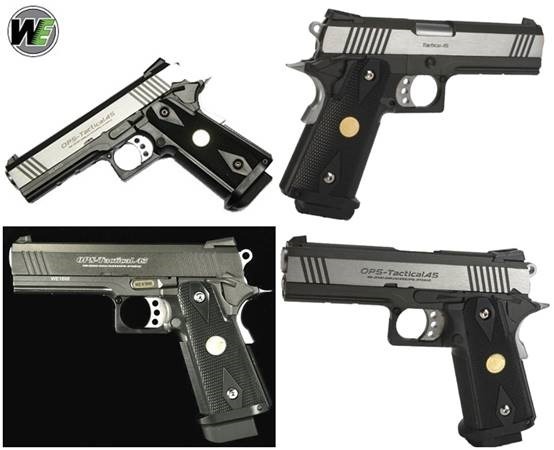 Very similar to Marui, we find it the most valued model in Hi-capa 4.3 series. The cost saving supports the upgrade internals. Lots of cheap models lack quality carvings on slides but this one won’t fail you. If you are looking for a medium size M1911 with full metal frame even smaller than G_17, this is it. Especially recommend the two-tone,【GP204-OPS-S】, they are often in lack status. With attacker in front of the slide, these two models show their aggressiveness when pointing to enemies. The difference between Type K【GP206】and Type R【GP205】 is the cuttings on aluminum slide. They share the same magazine with 5.1, 6, and 7,【MG-P01】, which is 28rds loading, the charm of double stack magazine, and the origin of “Hi-capa”. Judging from internal technical sheet of WE, Jia Dyi assembled the table for gunners who hate to compromise with original settings. 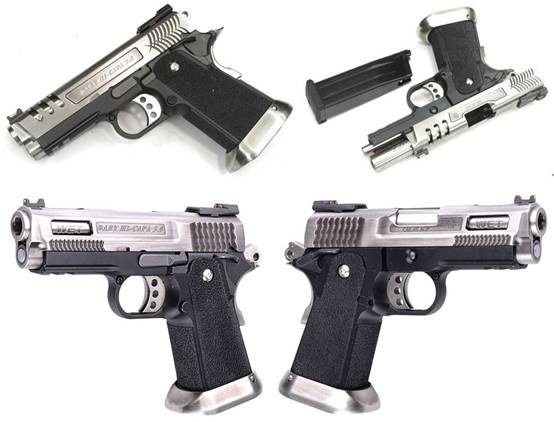 Not only tens of Hi-capa can found its best upgrade solution, but also the other brands/models as well. Like we said, the fun of Hi-capa exists in the process of upgrading and experience the payoff. For the said upgrade parts from Maple Leaf or Poseidon, please contact local dealers first if you wish to know more. Jia Dyi as usual, provides the turnkey solution based on product knowledge, agent portfolio, and hospitality to service. Let’s meet at sales@jiadyi.com see what sparks will be brought today!